General Motors Co. and OnStar will offer owners of new 2011 Chevrolet, Buick, Cadillac, and GMC vehicles mobile applications to access their vehicle information and OnStar services from the smartphones starting today. The mobile applications -- called myChevrolet and OnStar MyLink -- are now available to Android, iPod and iPhone users as free downloads on android.com and apple.com. The two applications' features fall into three categories: location-based services, vehicle-specific information, and OnStar connectivity, GM said in a statement today. 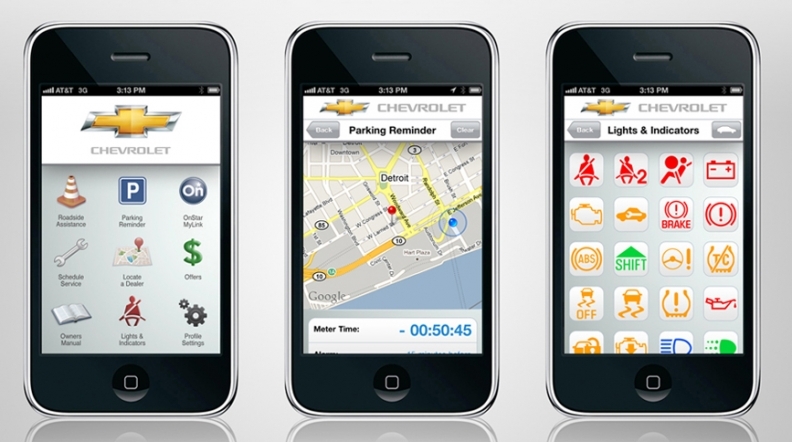 GM first announced plans for the new apps in July. Smartphone users who download the applicatons will have access to commonly used user manual information on vehicle functions such as instructions for radio-presets, and warning and indicator lights. Users will also be able to use GPS enabled functions to locate their vehicle in a parking lot, and request roadside assistance or schedule a service appointment with the closest Chevrolet dealership. "This is a great example of how we are focusing on smart technologies that address customers' needs," Chris Perry, Chevrolet's vice president of marketing said in a statement. Users who download both applications will have access to integrated myChevrolet and OnStar MyLink features that utilize OnStar services such as remote access to vehicle door locks, ignition, and diagnostic information, including fuel tank level and range, remaining oil life, and tire pressure status and recommended level. Any user can download the apps for free. Users must link their vehicle's VIN number with the app to access model specific services and features. GM says users also need to download both apps if they want to use the integrated functions. If user don't subscribe to OnStar, they won't be able to use the OnStar specific features.